***Please be advised***Team Care workers at Central States Pension Fund, ended their strike Monday. Over 200 Teamster workers continued to show unity and strength on the second day of the strike. Teamster employees who work for TeamCare and the Central States Pension Fund have voted to strike. The rain and cold couldn’t stop over 200 Teamster employees from Standing Strong on day one of the strike. One of the major issues is production standards for call-center workers. The members will be back on the strike line on Monday, March 18, 2019 at 6 am. 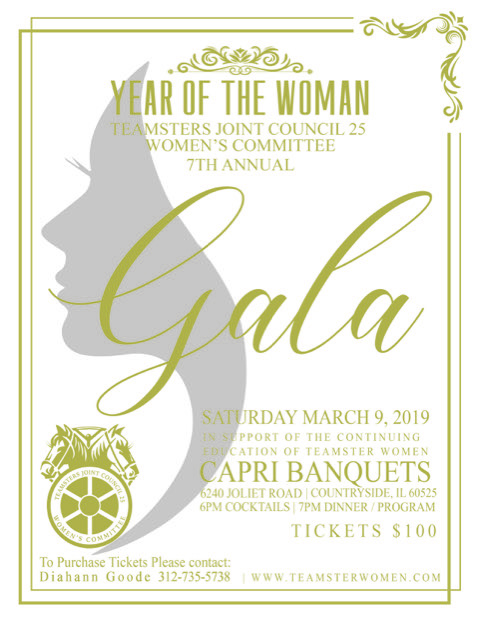 Joint Council 25 Women's Committee 7th Annual Gala and Scholarship Banquet The Teamsters Joint Council 25 Women's Committee will be hosting their 7th Annual Gala on Saturday March 9, 2019 at the Capri Banquets, 6240 Joliet Road Countryside, Il. 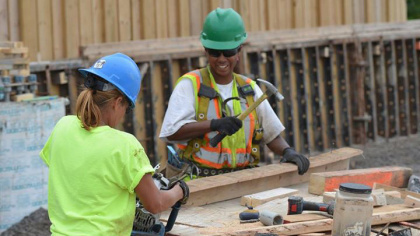 For over 70 years, Local 743 has played a pivotal role in the IBT organization. Once called the "progressive union," Local 743 has been at the forefront of the battle for workers' rights and civil rights in Chicago and Illinois. Local 743 is home to 10,000 hardworking men and women serving health care, mail order, technical and warehouse employees. Local 743 believes that workers are the union. We are committed to putting members first and empowering men and women with the tools to help enrich their lives and their families. 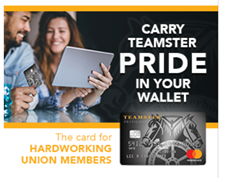 Teamsters Local 743 is an affiliate of Teamsters Joint Council 25, which represents more than 125,000 hardworking men and women throughout Illinois and northwest Indiana. The deadline for the Teamsters Local 743, 2019 Presidents Scholarship is April 26, 2019. Current graduating high school seniors that parents or legal guardians are Local 743 members in goods standing are eligible to apply. To view the guidelines, qualifications or to apply, click the link below. ***Please be advised***Team Care workers at Central States Pension Fund, ended their strike Monday. Over 200 Teamster workers continued to show unity and strength on the second day of the strike. The contract will be up for a vote Tuesday, which includes full retro pay and all workers returning back to work. The February Monthly General Membership Meeting will be held on February 4, 2019 at the local 743 union hall. Officer Gregory Moore from the Cook County Health and Hospitals Systems will be conducting an active shooter presentation. Unfortunately in today’s world, active shooter preparation is becoming an essential emergency response practice for organizations of all shapes and sizes. In light of the tragedy that happened at Mercy Hospital this past November, local 743 and President Simmons wants to prepare our members with the tools that could possibly saved their lives if the unexpected were to happen. The meeting will start promptly at 6:00 pm and presentation will begin at 6:30 pm. 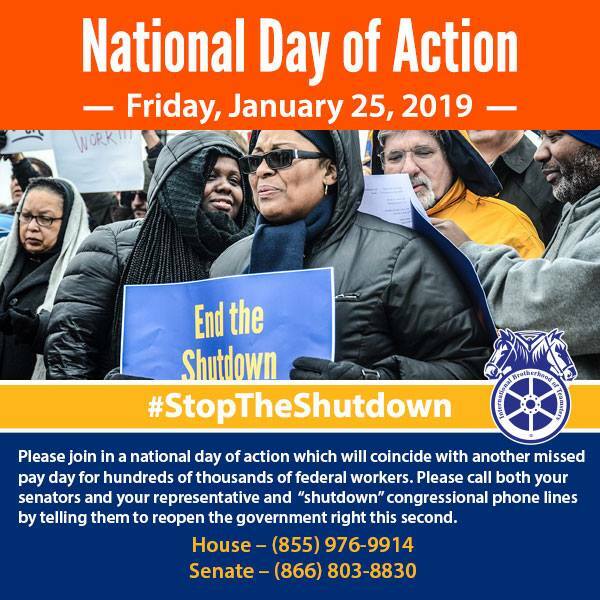 Union stewards are strongly encouraged to attend. The meeting will be credited towards the stewards ground rules and requirements that were updated on 12/12/18. Thank you for serving as a Union leader at your worksite. Please be advised that the ground rules and requirements for Local 743 union stewards implemented by the Executive Board in 2012 have been updated. 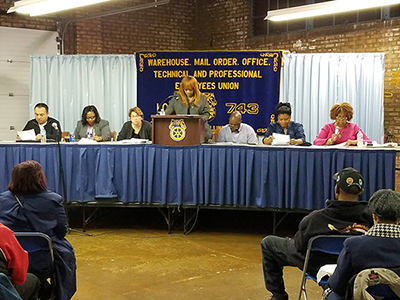 In order to monitor steward participation and implement consequences for stewards who do not comply with their obligations, the Local 743 Executive Board passed a motion on 12/21/18 to review steward participation on a quarterly basis to determine if the stewards are in compliance with attendance at membership meetings and trainings in order to receive their quarterly stewards reinbusement checks. Also attached is the union steward job description. TEAMSTERS LOCAL 743 MEMBERS COME OUT IN FULL FORCE TO SUPPORT A WORTHY CAUSE. TEAMSTERS LOCAL 743 MEMBERS COME OUT IN FULL FORCE TO SUPPORT A WORTHY CAUSE. 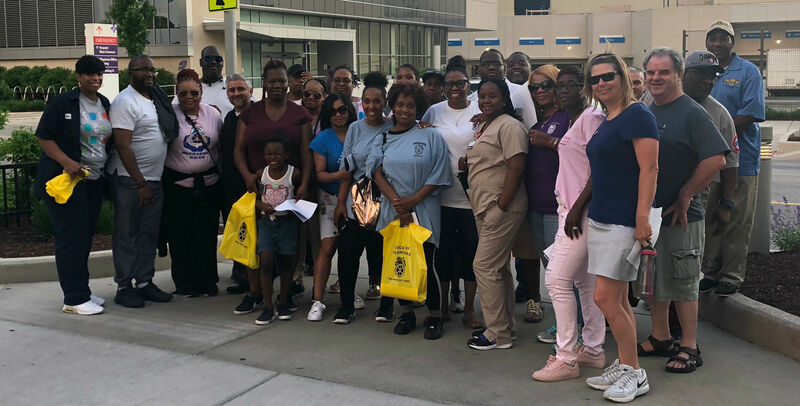 Teamsters Local 743 in partnership with the JC25 Women’s Committee raised over $13,000 dollars for the American Cancer Society’s 2018 Making Strides Against Breast Cancer Walks. Each year dozens of Teamsters Local 743 members participate in support of the Making Strides Against Breast Cancer Walk event at Chicago's Soldiers Field. 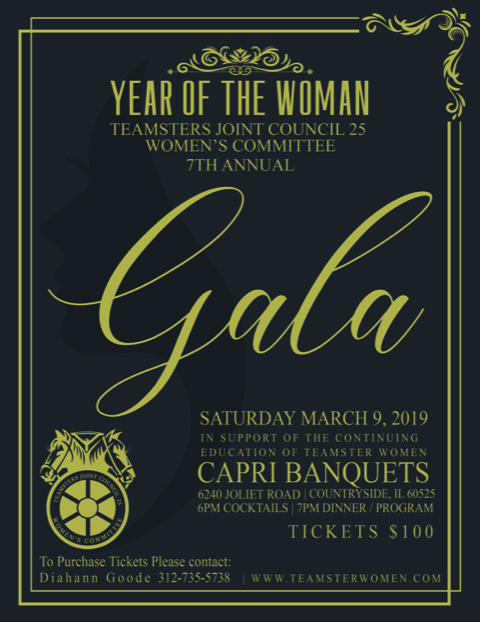 This year, Local 743 in partnership with Teamsters Joint Council 25 Women’s Committee has committed to be the Start-Line Sponsor. Teamsters Local 743 Stewards attend Joint Council 25 Annual Stewards Training Several dozen local 743 stewards attended the Joint Council 25 Annual Stewards Training on Saturday August 19, 2017 at Joint Council 25 in Park Ridge Illinois. John Magna from Illinois Advocates and Labor and employment practitioner John R. Bielski from Pennsylvania were the class instructors. 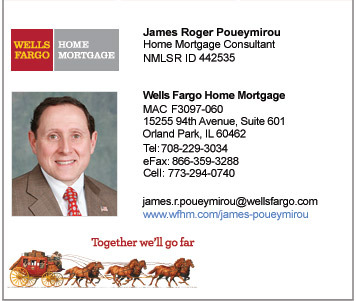 OUR NEWSLETTER IS GOING DIGITAL! As a labor organization, staying connected with our members is very important to Local 743. To save trees and to put more resources towards more programs and initiatives that will improve our members lives, our newsletter is moving towards an electronic format. Teamsters Local 743 conducts Healthcare Stewards Training on Saturday February 17, 2017. Over 60 local 743 stewards attended the Healthcare Stewards Training on Saturday February 17, 2017 at Local 743. Commissioners Tom Jeffery and Emil Totonchi from the FMCS were the instructors. Black History Month, or National African American History Month, is an annual celebration of achievements by black Americans and a time for recognizing the central role of African Americans in U.S. history. As we continue to celebrate Black History Month, let us honor Clara Day. Clara Day’s contributions to Teamster history and Black History are truly remarkable. Dec 16 2017 Scholarships Announced!